There’s something off about the notion that coming out is a one-time event, like marking your birth or the first day of graduate school. Sure, you can come out on a given day for the first time and if you’ve found yourself in a position where you are safe and wanting to do that, it’s absolutely a day worth celebrating. Chances are, though, if you ask many queer people when they came out, they’ll tell you not only about a general period of time but also that to be queer is to be constantly coming out. Every time you start a job and drop mentions of your girlfriend into conversations with your new co-workers hoping that’ll keep them from presuming you’re straight. Every time you see a doctor. Every time you meet an out person and you raise an eyebrow extra hard to make sure they pick up what you’re putting down. You come out over and over and over again. For Pride in 2017, Facebook released a limited-run reaction emoji. For one month, the thumbs-up and the heart and the “WOW” face were joined by a rainbow flag. The emoji was only available in certain places, a list that excluded locations where the LGBTQ community faces discrimination under law, like Egypt and Singapore. In the United States, some users in areas that also weren’t chosen were given the option of liking Facebook’s LGBTQ@Facebook page to gain access to the emoji. Which is another way of saying, Facebook asked users to proffer up the info that they were queer — or allies to queer folks — in exchange for the emoji. That feature caught flak when users noted that for other limited release emoji — like the daisy for Mother’s Day — users were not given a choice to opt in or out. The emoji just appeared for all users in regions where Mother’s Day is celebrated. Facebook seemed to want to snag the credit for being inclusive, without actually being truly inclusive. Like the reaction emoji, the “Came Out” life event gets near the mark but doesn’t quite hit it. People who wanted to come out on Facebook already had an outlet — the status — for that. One that didn’t feel quite so much like Facebook shouting Hey, look we’re doing a THING for the LGBTQ community! 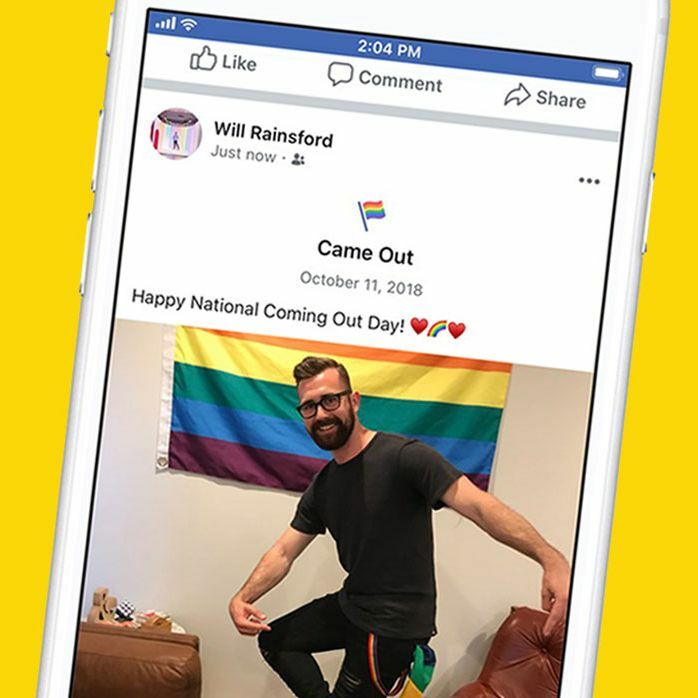 It might have been better, or at the very least felt less contrived, to just let users choose to celebrate National Coming Out Day with standard posts and photos. For a platform that puts so much emphasis on sharing and building community, this is an instance where people actually do that. And benefit from it. Facebook didn’t need to wrap it up in a rainbow flag in honor of October 11. It’s probably too late for me. Facebook already knows I’m gay. I’ve told it six ways from Sunday, from groups I’ve joined to the number of times I’ve clicked ads for Brandi Carlisle shows. I’ve even posted on Instagram — Facebook’s great, white hope — for National Coming Out Day over the years. Facebook is free because we pay in buckets and buckets of personal data. The more information it has about you, the better it can target ads to your specific interests. Which means the more money it can make selling those ads. At this point, it’s hard not to feel wary about giving Facebook any more information. In September, the company announced 50 millions users had had their data breached. (And then didn’t really seem concerned with alerting users.) The company is still licking its wounds from the Cambridge Analytica scandal, which broke in March. By adding a Life Event for coming out, Facebook is just giving users a cleaner way to hand over neatly packaged personal information, complete with a timestamp. It might seem like it’s about pride, but really it’s about data.